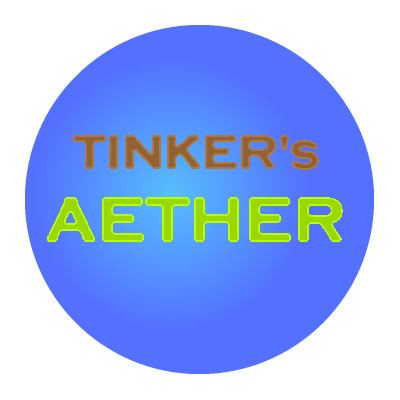 Tinker's Aether is an addon for Tinker's Construct which adds support for materials from Aether Legacy. Each of these that have corresponding tools in Aether Legacy have traits somewhat equivalent to the abilities already existent in those. Materials can be individually disabled in the config as of Version 1.0.2. Currently the mod only adds one new tool, the Dart Shooter. The Dart Shooter acts much like its counterpart from Aether Legacy, and can shoot all of its darts. In addition, you can make custom darts much the same you would make other ammunition items in Tinker's Construct, and these can also be fired from Tinker's Dart Shooters. Both Darts and Dart shooters can be disabled entirely in the config as of Version 1.0.2. Valkyrie Metal ingots, nuggets and blocks are added by the mod, used to create Valkyrie tools and weapons in the smeltery. 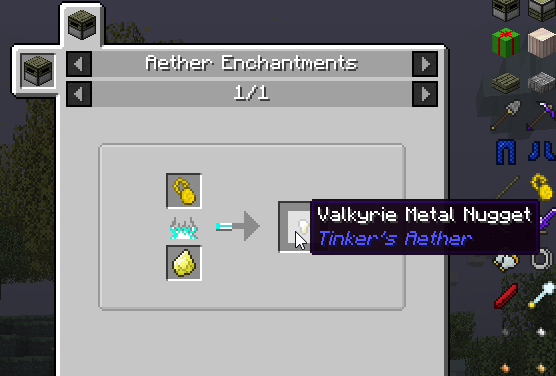 You can also craft Aether Legacy's regular Valkyrie tools and armour with them. They can be obtained through the smeltery (smelting down undamaged Valkyrie armour gives the appropriate amount of ingots), putting Victory Medals into an Enchanter (each medal gives one nugget), or found in Silver Dungeon chests (regular chests can rarely have nuggets and/or ingots, the reward chest often has nuggets and/or ingots and can very rarely have a block). Holystone Smelteries! You will be able to make Seared Holystone, and with it Holy Smelteries. Maybe they'll even have a bonus compared to regular smelteries? I would like to add support for Construct's Armory as well, with the ability to make Gloves and stuff. Any plans to update and make it work with Aether II: Highlands? They are currently in "compatibility mode" and trying to make the mod work well with others. I have more tinkers construct mods than just tinkers construct: TAIGA, Tinker I/O, Tinker's JEI, Tinkers' Addons, Tinker's Compendium, Tinkers' Complement, Tinkers' Tool Leveling, TinkerStages, and ToMeTinkers along with this mod and just regular tinkers construct but It won't seem to let me use gravitite in the smeltery I haven't tested other ores but I'm stumped. do you know how to fix this? Hey, here's an idea I have for Valkyrie Metal! I've already added the recipe myself with minetweaker. Gives you a fun reason to fight valkyries. As long as the modpack is here on CurseForge, go ahead! I encourage it! Sadly I'm using it for AT Launcher, but allright. Thanks for making such a good mod and have a nice day! once aether 2 is stable are you planning on adding support for that? Maybe? One of the Aether II Devs recommended I wait until then. no major update in the last one ? I'm afraid not, sorry! The update was basically just making it work with the latest Aether version. Haven't been feeling motivated to add things for a while. Might get back into it soon, though! all the support man ! support for newest aether version? Will be released shortly! Apologies for being late. Can you add support for the 1.7.10 version of aether legacy? Sorry, but 1.7.10 is too old of a version for me to reliably support. It would require a complete rewrite of everything on my end. 1.7.10 is over 4 and a half years old at this point, I would like to focus on the latest versions possible.